Sure-Pak Genuine GI Military MRE Meals (12 Pack) - Ready To Eat! Direct From US Government Contractor. 12 Meals Included Per Package. Various & Assorted Types. Each MRE Includes Main Entree, Side Dish, Dessert, Crackers, Spread, Coffee, Beverage Mix and Accessory Pack. Dimensions: 16” x 10” x 11”. GSA Compliant. Each MRE Includes Main Entree, Side Dish, Dessert, Crackers, Spread, Coffee, Beverage Mix and Accessory Pack. Dimensions: 16" x 10" x 11". Genuine GI - GSA Compliant. 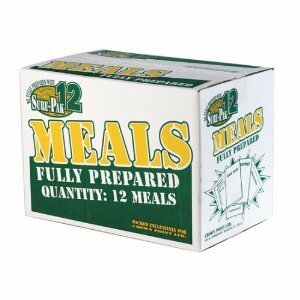 9217 SurePak 12 MRE's- Meals ready to eat.